India Post will recruit Gramin Dak Sevak Posts throughout the India Postal Circles Andhra Pradesh Telangana and many other. 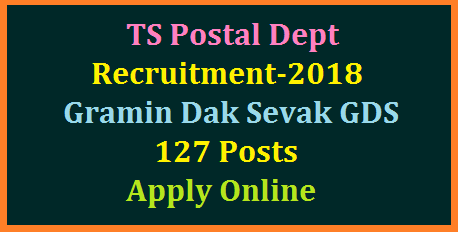 GDS Vacancies Educational Qualifications Technical Knowledge and othe eligibilities telangana-postal-circle-recruitment-gramin-dak-sevak-127-vacancies-apply-online-results-download Telangana Postal Recruitment 2018 notification for Gramin Dak Sevak posts is out and can be obtained from www.appost.inTelangana Postal Circle Recruitment 2018 Telangana Postal Circle has recently declared a fresh recruitment notification to fill up 127 Gramin Dak Sevak posts. This is a very nice opportunity for the job seekers who are in search of Telangana Govt Jobs, Postal Jobs 2018. Candidates who wants to apply can submit their application form through online mode by visiting the website www.appost.in. Job aspirants who have qualified in their 10th class are eligible to apply for these Telangana Postal Jobs. And also, all the applying candidates should own minimum age of 18 year and maximum age of 40 years. Scroll down this web page to know about TS Post Gramin Dak Sevak Recruitment 2018 which includes category wise vacancy details, District wise TS Gramin Dak Sevak vacancies. Aspiring candidates who fulfill the eligibility criteria can apply for Telangana Postal Circle Gramin Dak Sevak Recruitment 2018 starting from 20th November 2017 up to 19th December 2017. Selection committee of Telangana Postal Circle will prepare the final list of desired candidates on the basis of marks obtained in their academics. Job fighters who are appointed as Gramin Dak Sevak will be given a monthly salary of Rs. 2,295/- to 6,470/-. All the useful information about this Telangana Post Office Recruitment 2018 like age limit, application fee, salary details, qualifications, online application process,TS Postal Circle Exam Pattern etc., are provided in this post. The candidate should pass 10th standard from approved state boards by the respective State Govt. / Central Govt. No weightage will be given for possessing any qualification(s) higher than the mandatory educational qualification. The Candidate passed Xth class examination in first attempt will be treated as meritorious against those passed compartmentally. Candidate who desires to apply online will have to register himself / herself in the portal through https://indiapost.gov.in or http://appost.in/gdsonline with the basic details to obtain the Registration Number. Candidates already once registered in http://appost.in/gdsonline need not register again. The same registration number should be used for submission of application. Any candidate who forgot the registration number can retrieve the registration number through option ‘Forgot registration’.